I’m going to try something a little crazy here, so bear with me and play along, okay? 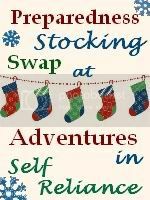 Anyway, this year, I thought I’d have a little stocking stuffer fun, so I am hosting a preparedness stocking swap here at Adventures in Self Reliance. If you are interested in giving and receiving some fun preparedness/self reliance related stocking stuffers this year, please join in the fun. Here’s the basics: I will assign each participant a new friend for whom they will prepare and ship a stocking full of prep related goodies. And another new friend will be shipping goodies to you. How fun is that? Sign up to participate by sending me an e-mail here. Please include your ship-to adress and your blog address if you have one. The deadline to sign up is Monday, Dec. 7th. Please only sign up if you are for sure going to participate, we don’t want anybody left out. I will e-mail you the info for the person to whom you will be sending stocking stuffers. I should be able to get all this information out by Dec. 10th at the latest, probably before. Get to know them, read their blog if they have one, and get some ideas. Think preparedness and self reliance . . . things like cooking or canning supplies, items for an emergency kit, flashlights, candles, you get the idea. Choose gifts. Be sure to include preparedness type items–that’s the point here–have fun and get better prepared. I would encourage you to use your imagination rather than your wallet. Be creative. 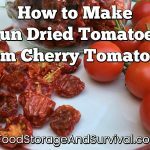 There are quite a few preparedness items that are cheap or free or you can make yourself. You probably already have a few extra items around your place you could use in the swap. I don’t want to have a dollar limit, but I also don’t want anyone to feel they got shorted, so I am recommending about $20 total. And they should all fit into a standard size stocking, which you will NOT need to provide. (No Mom, not the ginormous stocking you made sweet husband, a STANDARD size stocking.) You all do have your own stocking, right? Ship your stuffers by Thursday, Dec. 17th so everyone will have them by Christmas. I really hope a bunch of you join in on the fun here, but even if only a few want to participate it will still be fun. Please feel free to invite a friend, or post about this stocking swap, or grab my stocking swap button my sweet friend made me late last night because she loves me that much (thanks Sharla!). Just copy the text in the box and paste it on your blog. Men, you’re invited too of course! That's a pretty unique idea! Sounds like it could be a lot of fun! I think we can all use some more fun that we adults can participate in! Great idea! Last year I got a mug I've never used and a box of English tea. lol. I'm thinking this time might be a little more useful…. This sound very unique and I think I will jump right in.